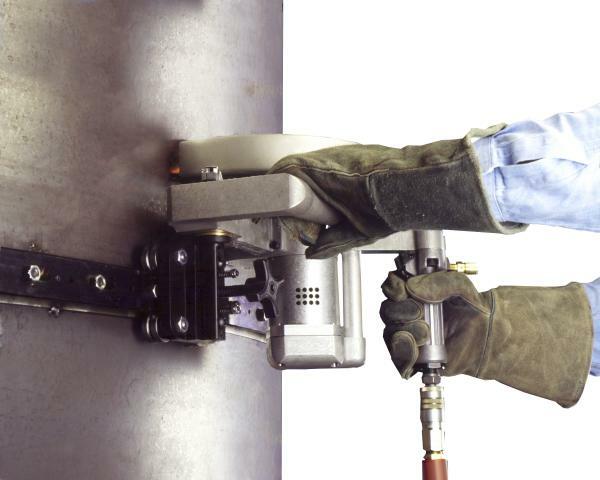 Quick set-up and fast straight cuts with no HAZ are what MILLHOG® Air Powered Saw Kits are all about and this kit is equipped to do it well on warped boiler tube panels, contoured and serpentine structures. The APS-438FL – Air Powered Saw Kit includes a six foot Flex Track and alignment gauges for accurate mounting with the cut line. The ¾" air hose is equipped with a heavy duty filter and oiler that deliver plenty of air flow, protection from contaminants and lubrication for the powerful 3hp motor. Equipped with a 12" Cut-Off Blade it provides a maximum depth of cut of 4.375" and requires 13.5" clearance. Please check out the available accessories that help save time and provide accurate boiler tube membrane removal, high speed beveling of tube ends and pipe cutting from 6" to 60".